From a controversial subject to its promise to reduce costs, scale up, and provide real-time access to data, cloud computing has shed its reputation and companies are increasingly migrating to this service, less understood is how to leverage the cloud as a business enabler. There are plenty of reasons, why even some of the most highly vaunted businesses fail, but one reason stands out–Their inability to deliver a satisfying customer experience. CRMIT Solutions is a pioneer in delivering cloud based customer experience (CX) consulting & solutions. Basically, helps you keep pace with the demands of the market. It also enhances business agility and enables you to make changes to your business processes including sales, customer service and marketing, this in turn helps you easily achieve your customer relationship goals. With over 200+ certified CRM consultants and over 250+ successful CRM deployments globally across 25 countries, CRMIT Solutions offer a range of CRM++ applications for accelerated deployment. So as your company contemplates moving its core business functions to the cloud, don’t just ask how the move can save money, decide how the cloud can enhance your business performance as well as the customer experience. That will entail, including people in your organization responsible for architecting the customer experience in the migration planning. IT can no longer operate in a silo when it comes to cloud migration. Together, IT and customer-facing teams can design a strategy that enables efficiency as well as provide a better customer experience. 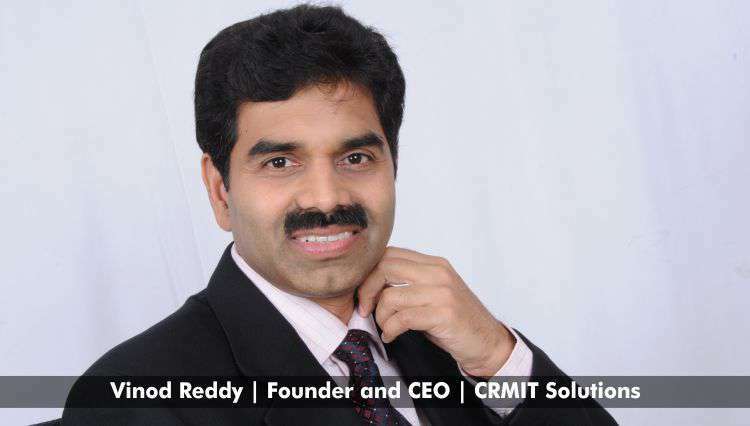 Vinod founded CRMIT Solutions in 2003, and continues to drive CRMIT’s business & technological strategies. He brings a vast experience from his technical and management positions in the past, including those from American Airlines, BroadVision and Sabre Holdings. He has been instrumental in growing CRMIT Solutions from a startup to one of the pioneers in SaaS based Customer Relationship Management (CRM) solution providers. Vinod is also responsible for bringing in one of the largest cloud based CRM deployments to the credit of CRMIT Solutions. The most recent initiatives, from CRMIT Solutions is the CRM++ FieldSalesPro™, a must-have for field sales personals for in-person or virtual meetings. The mobile app enables you to coach your sales team, manage and track meeting effectiveness, enable quote management and opportunity closures with effective team collaborations. The app allows you to keep your focus on your audience, and make your first impression count. Available both, on Android and IOS platforms with xCRM integrations to Salesforce and Oracle Sales Cloud, the CRM++ FieldSalesPRo™ enables your field sales teams are 7-times more likely to qualify their opportunity when they get it right the first time. According to Vinod Reddy, Founder & CEO, CRMIT Solutions, “Platform-as-a-Service (PaaS) will transform more than any other sector in the cloud computing space over the next several years.” Our roadmap for PaaS is specially designed to support building and maintaining micro-services applications, promises to make moving applications from the private to public cloud and back again relatively seamless.